The property along Gibson Hill Road where St. Anne is no longer proposing to build a church. St. Anne Orthodox Church has given up plans to build a church and fellowship hall on Gibson Hill Road, and the congregation’s property there is for sale. It was in February 2017 that the Albany Planning Commission voted 6-1 to approve a conditional use permit sought by the church for the 2.7 acre property at 1033 Gibson Hill Road N.W. The heavily wooded residential parcel lies northwest of the North Albany roundabout. A reader asked me what was going on after seeing the property advertised on a real estate site. I emailed Father Stephen Soot, the rector of St. Anne. He’s been away on church business but got back to me on Sunday. “Yes,” he wrote, “our church has put our North Albany property up for sale. The market is such that costs for developing that lot have gone up considerably and we may have another, more affordable option in front of us. The congregation currently has 176 members, adults and children. Its church is the former Lewisburg Grange Hall. The North Albany plans approved in 2017 envisioned a church of about 8,600 square feet with a 60-foot-tall onion dome in the style characteristic of the Eastern church. There also would be a fellowship hall of about 13,500 square feet and parking for more than 60 cars. 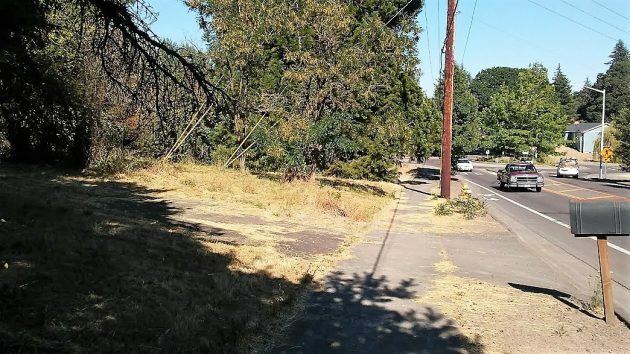 The proposal called for cutting down 157 trees. Hasso, thanks for the follow up. Maybe they should consider moving the Cumberland Church building there with the help of the city. No doubt a developer will purchase the land and destroy the trees. A Kickstart or Go Fund Me campaign would clearly define the broader public’s interest in moving a church – sans government financial involvement. Those interested can contribute. Not interested? Ignore the pitch. Capitalism is the acid test for this proposal.